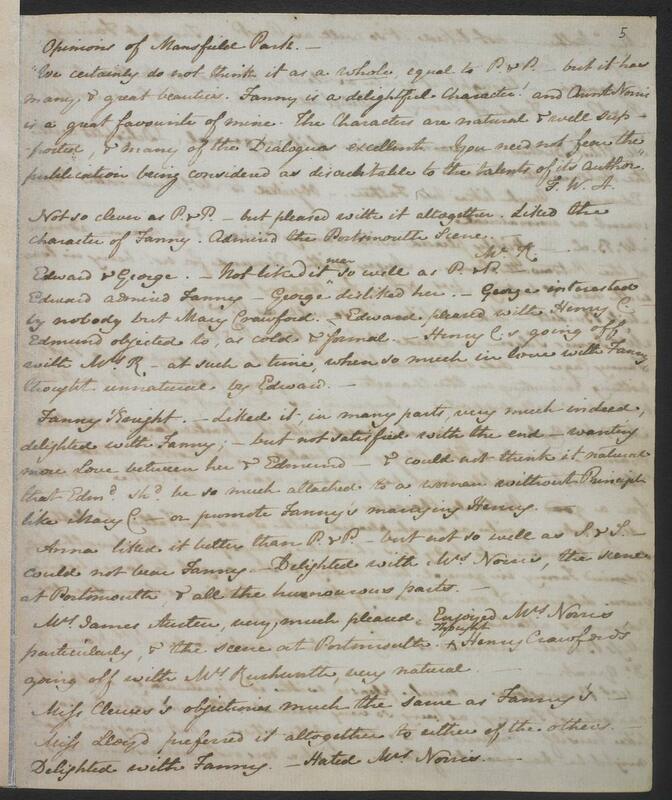 In an eight-page document, Jane Austen collected her friends’ and family’s opinions of her third and fourth novels, Mansfield Park (1814) and Emma (1815). The British Library recently made the manuscript available online as part of its great Discovering Literature: Romantics and Victorians collection. Below, I’ve transcribed Austen’s collection of feedback on Mansfield Park. This novel, literary scholar Pat Rogers writes, was always “relegated to the lower levels of the [Austen] pantheon” during her life. While none of her novels received much critical attention while Austen was alive—and her work provoked active disdain from some nineteenth-century literary lights—Mansfield Park was particularly neglected, and in the nineteenth century it went through few published editions. By today’s standards, the honesty in these collected observations can seem blunt, bordering on cruel. Many of the readers who replied to Austen’s inquiries about Mansfield Park told her that they liked “P.& P.” (Pride and Prejudice ) or even “S. & S.” (Sense and Sensibility ) better than her latest effort. Rogers notes that the Austen family was a little more likely to offer unvarnished opinions; the positive feedback in the document comes, on the whole, from people who weren’t related to Austen. There are a number of comments about the “morality” of the novel—critiques that would be common at a time when an assessment of moral message was one tool that people used to approve or disapprove of a novel. Rogers points to one of the only early published reviews of the novel, by Richard Whately, an author and clergyman who praised the novel for containing “moral lessons” alongside humorous moments. My transcript follows the image. Click on the image, or here, to reach the full document, including Austen’s collected critiques of Emma. Click on the image, or here, to reach the full document. “We certainly do not think it as a whole equal to P.& P. – but it has many & great beauties. Fanny is a delightful Character! And Aunt Norris is a great favourite of mine. The Characters are natural & well supported, & many of the Dialogues excellent. You need not fear the publication being considered as discreditable to the talents of its author.” – T.W.A. Not so clever as P. & P. – but pleased with it altogether. Liked the character of Fanny. Admired the Portsmouth scene. – W.A. Fanny Knight. – Liked it; in many parts, very much indeed; delighted with Fanny; - but not satisfied with the end – wanting more Love between her & Edmund – & could not think it natural that Edmd shd be so much attached to a woman without Principle like Mary C. – or promote Fanny’s marrying Henry. Mrs. James Austen, very much pleased. Enjoyed Mrs. Norris particularly, & the scene at Portsmouth. Thought Henry Crawford’s going off with Mrs. Rushworth [Maria Bertram] very natural. Miss Lloyd preferred it altogether to either of the others. – Delighted with Fanny – Hated Mrs. Norris. My Mother – not liked it so well as P.&P. – Thought Fanny insipid. – Enjoyed Mrs. Norris. Cassandra – thought it quite as clever, tho’ not so brilliant as P.&P. - Fond of Fanny – Delighted much in Mr. Rushworth’s stupidity. My Eldest Brother – a warm admirer of it in general. – Delighted with the Portsmouth Scene. Edward – Much like his Father. – Objected to Mrs. Rushworth’s elopement as unnatural. W.B.L. – Highly pleased with Fanny Price - & a warm admirer of the Portsmouth Scene. – Angry with Edmund for not being in love with her, & hating Mrs. Norris for teasing her. Miss Burdett – Did not like it so well as P.&P. Mrs. James Tilson – Liked it better than P.& P.
Fanny Cage – did not much like it – not to be compared to P. & P. – nothing interesting in the characters – Language poor. – Characters natural & well supported – Improved as it went on. Mr. & Mrs. Cooke – very much pleased with it – particularly with the manner in which the Clergy were treated - W. Cooke called it “the most sensible novel he had ever read.” – Mrs. Cooke wished for a good matronly character. Miss Burrel – admired it very much – particularly Mrs. Norris & Dr. Grant. Mrs. Bramstone – much pleased with it, particularly with the character of Fanny, as being so very natural. Thought Lady Bertram like herself. Preferred it to either of the others. – but imaged that might be her want of Taste – as she does not understand Wit. Mrs. Augusta Bramstone – owned that she thought S. & S. and P. & P. downright nonsense, but expected to like MP better, & having finished the 1st vol – flattered herself that she has got through the worst. The families at Deane [?] – all pleased with it – Mrs. Anna Harwood delighted with Mrs. Norris & the green Curtain. The Westbury [?] Family – very much pleased with it; preferred it to either of the other. Mr. Egerton the Publisher – praised it for its’ [sic] morality, & for being so equal a composition – no weak parts. Sir James Langhorne & W.H. Sanford, having been told that it was much inferior to P.&P. – began it expecting to dislike it, but were very soon extremely pleased with it - & I believe did not think it at all inferior. Charles – did not like it near so well as P.&P. – thought it wanted Incident. Mrs. Lifroy – liked it, but thought it a mere Novel. Mrs. Portal – admired it very much – objected chiefly to Edmund’s not being brought more forward. Update, Weds, June 18: An original version of this transcript had mis-transcribed the name “Cassandra” as “Cafiander,” with appended question mark. The error has been amended.